I'm coming to Tampa for my first headline tour! I'll have a new Live show, new visuals and a new album to play for you guys! Valentine’s Day Bash w/ DJ SOLTRIX @ RITZ YBOR! Celebrate the love of Latin music and dancing this Valentine’s Day!! 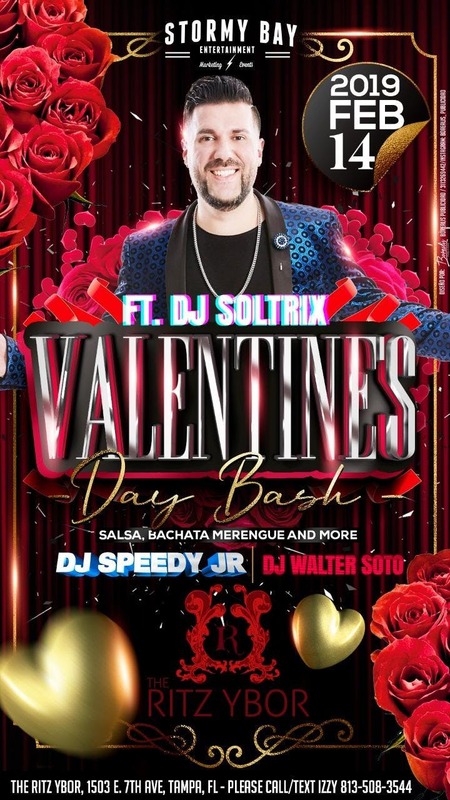 Join us at Tampa’s Premier Special Events Venue, The Ritz Ybor, for our Valentine’s Day Bachata Bash with DJ Soltrix and friends!! Dance the night away to Salsa, Bachata, Timba, Mambo, Mixes & more with DJ Soltrix and friends. More details to come. Plenty to love this Valentine’s Day!! Come and celebrate with us! !